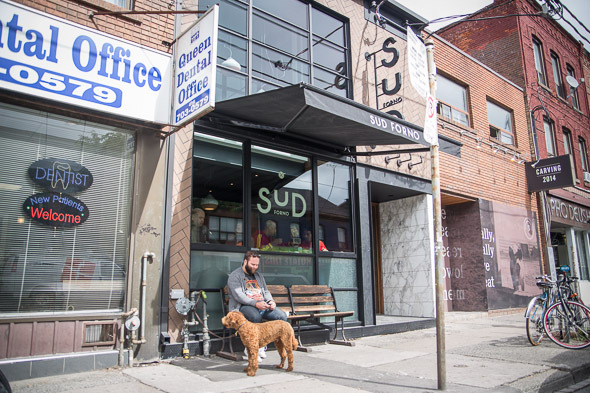 Sud Forno is the still new, Terroni bakery that opened this summer just a few doors down from the original Southern Italian eatery on West Queen West. The interior, designed by Giannone Petricone Associates, feels modern but also as if you've momentarily stepped a century or two back in time. 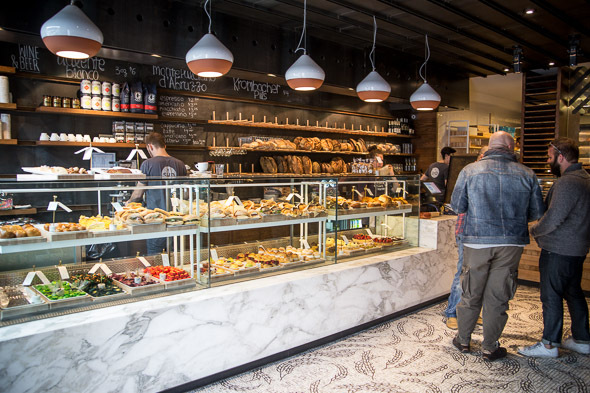 The marble, mosaic floor was commissioned from an Italian maker and is easily the central feature, it's equally beautiful as it is utilitarian and seemingly embodies everything this bakery is about; skilful workmanship; premium materials and lasting, time-worn Italian techniques. 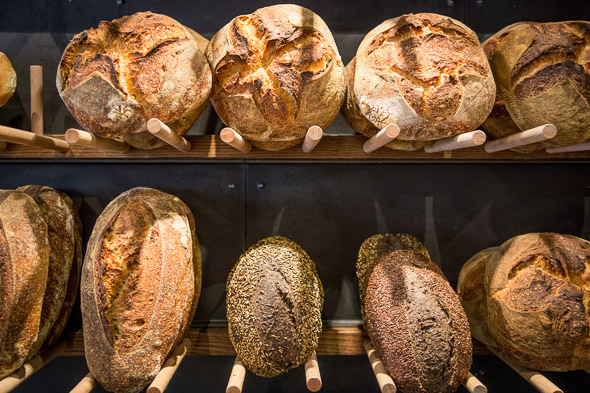 Loaves of bread line a wall behind the counter and are the 'Raison d'être' if you will; making Terroni's excellent breads available to enjoy around your own table. Head baker Fabio Pappa hails directly from Naples and brings with him expertise in bread-making. 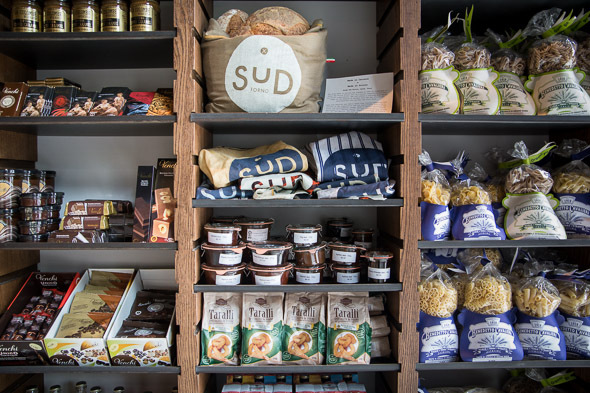 Amongst the most popular daily offerings are fresh Pane Pugliese, Integrale and Grano Arso all priced between $4-8. 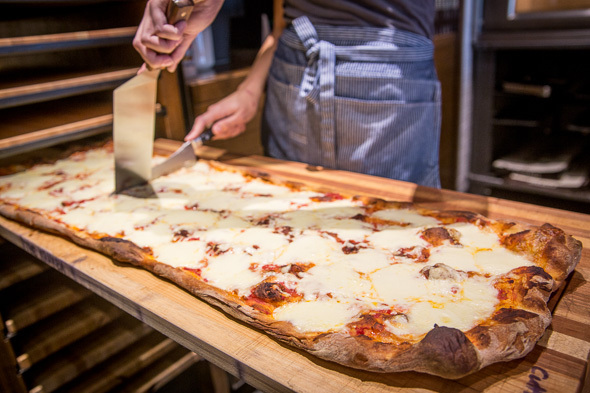 In time for lunch hour, there's Pizza al Taglio like the classic Margherita ($3.50), made in the Roman-style; Stirata Romana that is characterized by its long shape formed from stretching the dough. 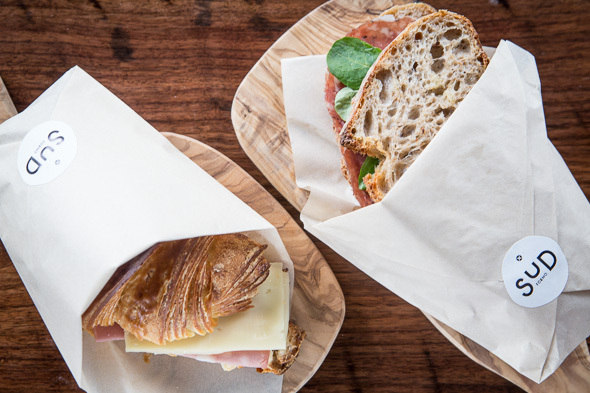 Sandwiches are made fresh daily on house bread or pastries. Variations like the Cornetto Prosciutto Cotto e Friulano ($5) and Panino Salame e Cambozola ($7) on Pane Integrale are finished simply with salt and pepper, perhaps a little olive oil, and then wrapped in paper for easy handheld takeaway. 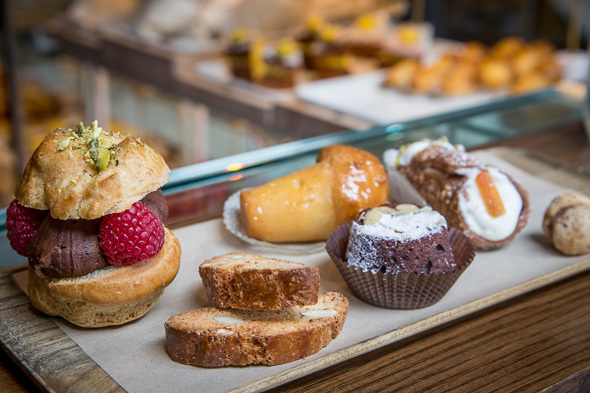 The glass display case upfront houses an array of dolci from pastry chefs Armamdo Palmieri and Carlo Lazzarino. Select from delicacies like Baci di Dama (50¢); Rhum Baba ($1.25/$2.50); Bigné ($1.50); Cantuccini (70¢); Mini Caprese ($1.50); or my fave Mini Cannoli ($1.50), filled with ricotta and decorated with pistachios and candied orange zest. The bakery is open daily from 8am to 11pm. While seating downstairs is limited to a street-facing counter, there is also an extra long communal table upstairs. Espresso based coffees are a given, and, housemade gelato is available too.